This beautiful and well tended scene was photographed in the late 1930s. Most Blantyre people will recognise Bothwell Bridge on the very fringes of Blantyre. The lovely and exquisite park was laid out and constructed in the mid 1930s on the Blantyre side of the River Clyde Banks. 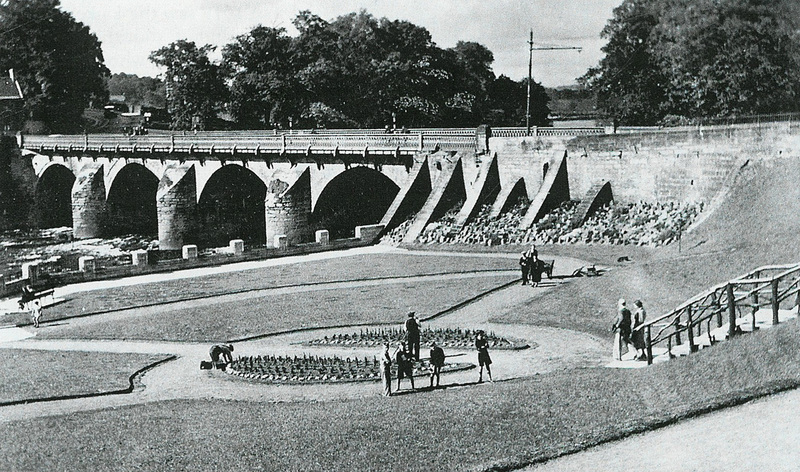 As can be seen, the grass was well kept, the gardeners attended to the flowers and with steps down from the path, trellises and impressive flood defences, it proved very popular with locals, keen for sitting in a beautiful setting by the side of the river. Steps also led down from the walkway on to the riverside itself allowing locals to even swim there or fish from the promenade when the river was in spate. The park survived in some fashion or other until the Expressway was built in the 1970s but never was as popular as it was in the early pre-war years. Nowadays, with the busy East Kilbride Expressway tearing through the middle of this area, the park no longer exists and it’s currently far from a peaceful place. Do you have memories of this park or this area? Why not share with us.